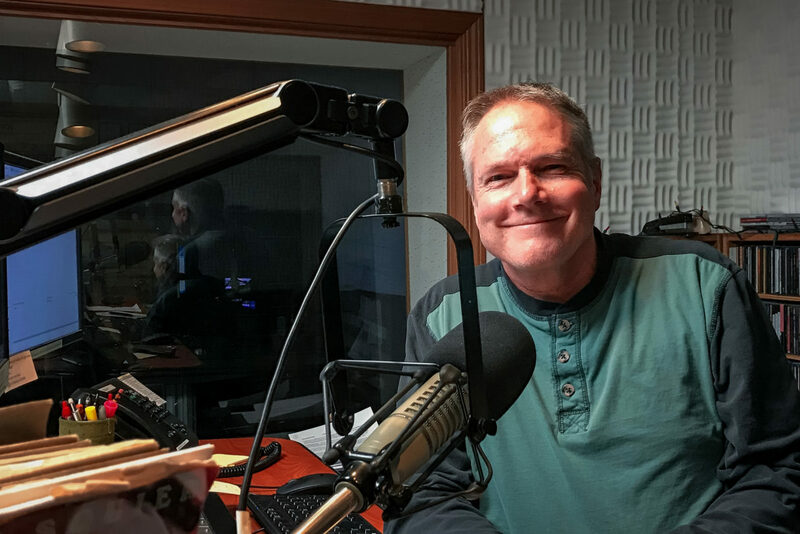 Matt Nylund in KNOM’s Studio A. Photo: Margaret A. DeMaioribus, KNOM. Matt backpacked solo through the Great Land in 1987-88 and left eager to return. When an opportunity in Nome presented itself during a search for health and physical education jobs, the move to the sub-Arctic felt natural. Matt Nylund grew up in Littleton, Colorado. He graduated from Metropolitan State College with a bachelor’s degree in kinesiology (with a K-12 education license) and a minor in health. He received a master’s degree in sport and exercise science from the University of Northern Colorado–Greeley. Matt taught physical education and health for 30 years: 29 of them in Colorado, and one in Melbourne, Australia, for a teacher’s exchange program in 2011. He’s coached for 33 years: mostly baseball and football. When not working or deejaying, Matt enjoys hunting, a pursuit for which there are myriad opportunities in the Nome area, and one that’s taken him all around the world. His interest in traveling has been philanthropic, too: in early 2018, he bicycled across the continental U.S. to raise money and awareness for diabetes. We’re thrilled to have Matt’s generous and energetic spirit as part of KNOM’s weekly schedule!